I like to eat Mexican whenever possible. I lived in D.F. as a child and I have many a fond memory of life and food there. 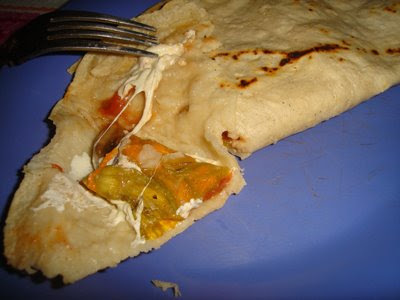 Classmates at Instituto Irlandés, my all-girl, plaid-green-jumper Catholic school, quickly taught me to train my taste buds to accept and in most cases like, a wide array of picante foods. Soon, I too was bringing chile piquín-dusted cucumber slices bathed in lime juice in Hello Kitty Tupperware to recreo and sprinkling the vibrant red dust on oranges and mangos. I also learned to appreciate Mexican counterparts to American candy bars and other sweets: Pulparindo, a chewy tamarind and chile bar; mazapán, a peanut-based marzipan; and Duvalín, vanilla and hazelnut cream that came in tiny packages with a plastic stick for an eating utensil. 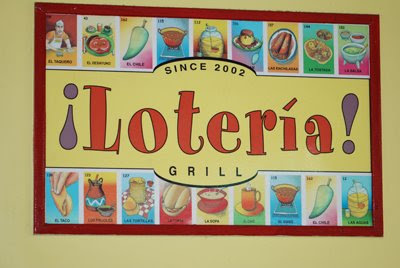 ¡Lotería! 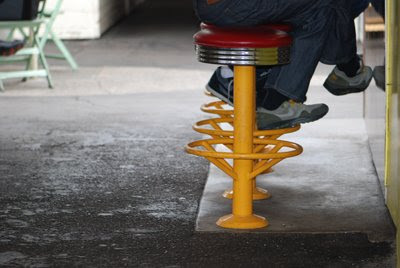 : Grab a table in the center of the LA Farmer’s Market or hop on a bright red stool and eat right at the counter. 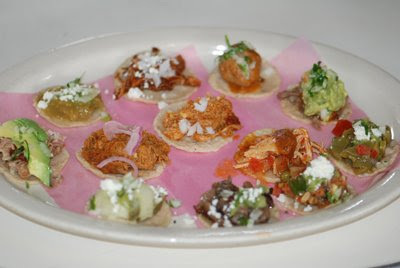 Eager to try everything on the menu, I ordered a sampler platter containing miniature versions of the twelve different taco fillings available, including, nopalitos (cactus salad), mole poblano con pollo (chicken with mole sauce), papa con rajas (potatoes with roasted poblano peppers), and chicharrones en salsa verde (pork rinds in tomatillo sauce). I can’t say I had a single favorite, but surprisingly for carnivorous me, the vegetarian nopalitos made a lasting impression. Luckily, I had a few people in tow and was able to taste enchiladas in hot and spicy red chile guajillo sauce that was eagerly mixed into the accompanying rice so as not to waste a drop; crunchy, crispy, corn tortilla tacos; and a mountain of chilaquiles verdes (fried corn tortilla strips sautéed in house-made sauces – either green tomatillo, chile guajillo, or mole) topped with eggs and dressed with queso fresco, crema, chopped onions and cilantro. 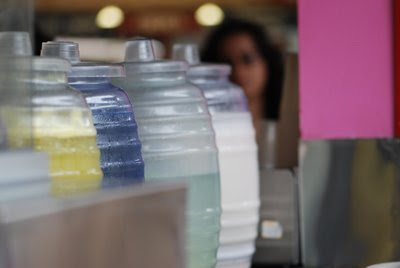 Oh, and of course, no meal is complete without an agua fresca, fresh fruit drinks in a variety of seasonal flavors. My pick: agua de jamaica, the refreshing, floral, bougainvillea-hued hibiscus tonic. As fate would have it, owner Jimmy Shaw happened by and we got to talking in English at first until we realized he was Mexican himself. We talked about food, of course, and childhood memories revolving around food…of course. It was a lovely encounter and made us feel like we’d just dined at a dear friend’s home. Eat right at the counter. Monte Albán, Mexican eatery with Oaxacan roots, was also a big crowd pleaser. 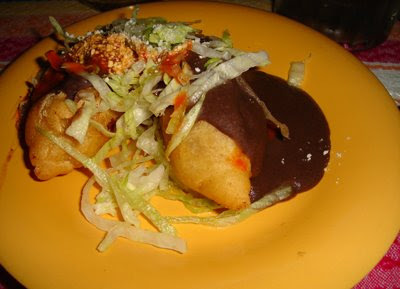 Señor O and I headed there for breakfast with my little brother, and, quite embarrassingly, I was presented with a colorfully sprinkled bun and cup of hot chocolate…because it as Mother’s Day and the hostess took me for my sibling’s mom. I was going to play along, but vanity took over and I just had to clear up that I was not old enough to be this 11-year-old’s mother. Well, technically I am, but still. …I digress. The food: I had enfrijoladas, with eggs naturally. 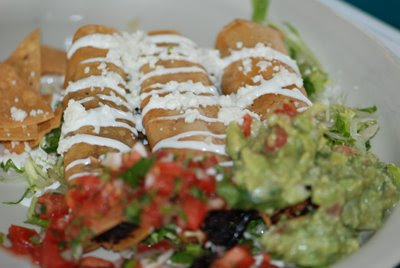 Enfrijoladas are similar to chilaquiles, only these corn tortilla triangles are smothered in thick black bean sauce. 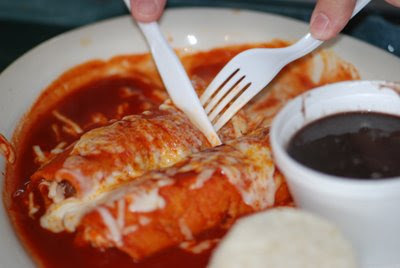 Señor O had a large plate of eggs scrambled with chorizo, and little brother opted for salsa de queso, melted cheese in a pool of spicy tomato sauce, a sticky mess that can be neatly folded into a slender and pliable corn tortilla. We made a return visit later that very same evening with family members who’d missed out on breakfast and had tamales with black mole, dense and chocolaty, zucchini blossom quesadillas, potato-and-chorizo molotes, deep-fried and crisp, as well as another round of enfrijoladas, this time with a side of cesina, thinly sliced, salted beef. 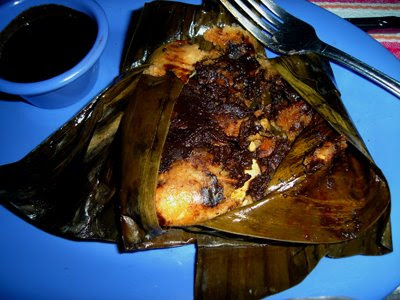 For dessert: ripe plantains, sliced and fried, then topped with condensed milk. As we like to say, barriga llena, corazón contento. (Full belly, happy heart).